On the last night of the 2012 Fringe Festival, I went to see an "Audience Pick" show that I had been hearing a lot about. 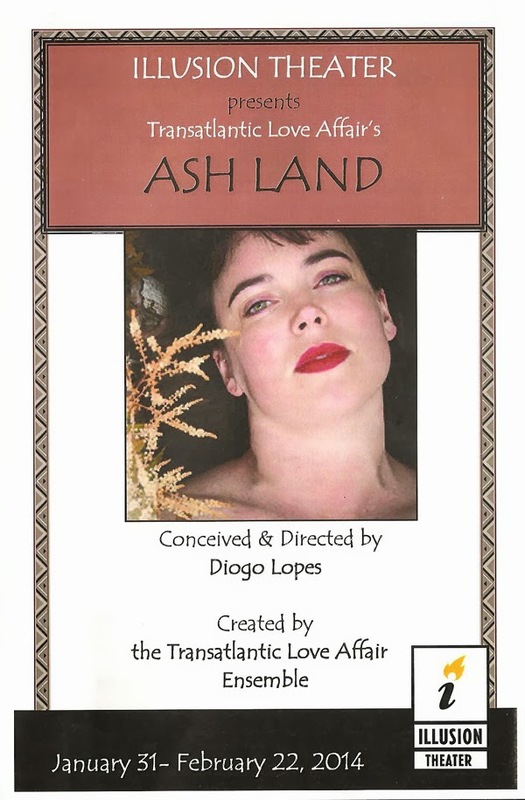 A play called Ash Land by a theater company called Transatlantic Love Affair, with which I was unfamiliar at the time. By that point in the fest I was fringed out - sick of the crowds and lines and parking and traffic. But sitting in the Rarig Center, I was completely transported by what was happening on stage in front of me and moved to tears. Such is the power and beauty of what Transatlantic Love Affair does, a style of physical theater that is so unique and special. They are currently remounting an expanded version of Ash Land as part of Illusion Theater's "Lights Up!" series, and it's just as heartbreakingly beautiful as it was the first time I saw it. 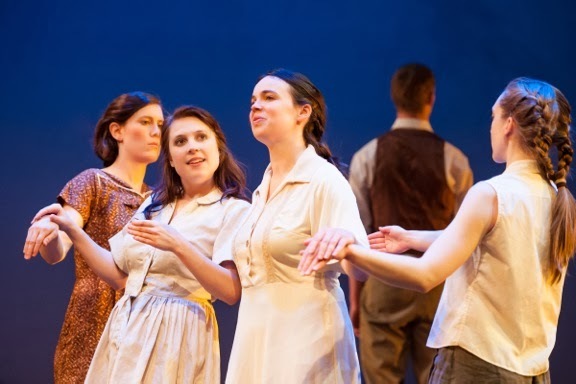 On a completely bare stage, this wonderful cast of eight (seven of whom were in the original production) create everything in the world of the story with their bodies and voices. They are the doors and windows, the waving wheat, the wind, the livestock, the water pump, furniture, a car, and most poignantly, the rain. Along with the subtle lighting (by Michael Wangen) and the melancholic sound of a steel guitar (played by Harper Zwicky), the movement of the cast is so evocative of a specific time and place that you can feel the dry heat, see the tumbleweeds blowing, and revel in the release of the long-awaited rain. The cast also sings a few songs from the traditional Americana canon that I love so much, including "Who's Gonna Shoe Your Pretty Little Foot," "Ain't No Grave," and "Poor Wayfarin' Stranger." The show has been expanded from its original Fringe length (under an hour) to about an hour and a half, which has allowed them to add a few new scenes, as well as given other scenes the room to breathe and expand a little. At the heart of this piece is the relationship between Ellie and her mother, which continues long after she dies. This relationship is beautifully expressed by the actors - Adelin Phelps as Ellie and Isabel Nelson (the other co-Artistic Director) as her mother. Along with Derek Lee Miller as Ellie's father, you can truly feel the love and loss in this family trio. Adelin is just wonderful as our heroine, with an open expressive face. Heather Bunch brings a gritty humanity to the role of the "evil stepmother." Nick Wolf, as the banker's son, is the one new ensemble member and fits right in, tall and lanky and adorably awkward when confronting Ellie. All of the other roles of the animal, vegetable, and mineral variety are filled by these actors along with Peytie McCandless, Eric Nelson, and Allison Witham. I'll leave you with how I concluded my blog the first time I saw the show. Friends, this one really touched me. And that's all I ask from theater - to move me in some way, whether it's to laughter or tears, or a different way of thinking about something, or a different way of seeing something. To leave the theater knowing that I'm different than when I walked in, that I've been forever changed (in some small way) by what I've seen. That's what this show did for me. *Yes, I plagiarized myself by copying the plot summary from my previous post about the show.